Thanks to its recent acquisition by Etihad, Alitalia is poised to be a force to be reckoned with. The beleaguered Italian national carrier has been the subject of bailout after bailout, but Etihad has now put it on a path to clean up its act financially and improve the in-flight and general customer experience. This is great news for flyers reeling from Delta’s mega-devaluation and move to revenue-based award redemptions. Not only is Alitalia a member of Delta’s SkyTeam, but it also has great deals on partner flights. And with three different credit card transfer partners, it’s easy to earn miles. On its own, Alitalia has a relatively small network, serving 102 destinations. Through its SkyTeam partners and position in the growing Etihad network though, the airline has global reach. That makes its round-the-world awards for 140,000 miles in economy and 220,000 in business a great way to check dozens of countries off your bucket list. How Can You Use MilleMiglia Miles? Alitalia operates three cabins on most of its own flights: business, premium economy and economy. In the airline’s nomenclature, economy is Classica and business class is Magnifica. Premium economy is called Ottima on short- and medium-haul flights, and Classica Plus on long-haul flights. On its own flights, Alitalia offers three different types of award tickets: Standard, Elite Award, Flex and Superflex. Elite Awards are only available to passengers with elite status, and simply offer more availability in economy. Standard awards are available in all classes and begin at 20,000 miles roundtrip within Europe. Basic changes are free, though changes to class, passenger name and carrier incur a 55 Euro fee. Flex awards are only available in economy and come with free changes, as well as an additional baggage allowance. Superflex awards are only for upper classes, including Ottima and Magnifica, but not Classica Plus. They must be booked by phone. Partner awards on Alitalia are available at significantly better rates than with most SkyTeam airlines, but they also have several restrictions. 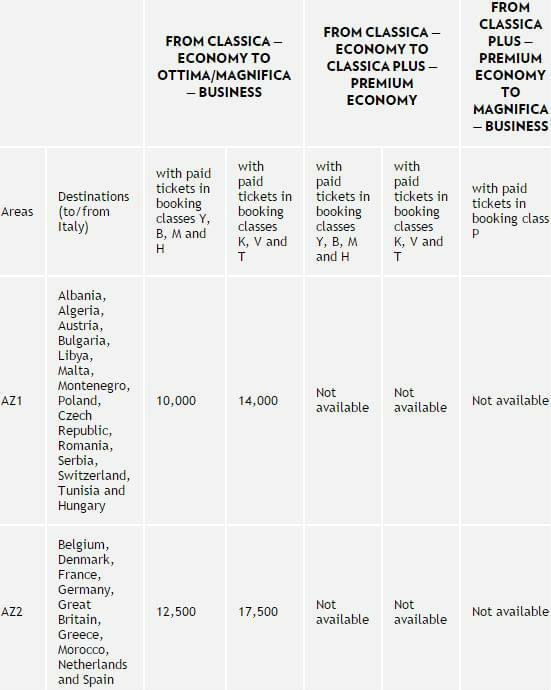 While one-way awards on Alitalia are annoyingly priced at 60 percent of a round-trip ticket, they simply aren’t available on partners. Neither are first-class cabins. And many of the East Asian airlines have significant blackout dates. Even with these drawbacks, the savings are usually worth it. SkyTeam partners are governed by one award chart while all remaining partner airlines have their own individual award charts. If you’re low on miles or don’t want to use or transfer too many, you can also get Cash & Miles awards starting at 5,000 miles for up to 25 percent off the purchase price. Alitalia offers one of the best business class awards you can find. You can fly between Europe and the U.S. for just 80,000 miles in Magnifica business class. Even with the high fuel surcharge, it’s easy to pay more just for coach with other airlines. Delta’s current business class prices start at 125,000 miles, making Alitalia’s award an absolute steal. You’ll get a great product, too. Magnifica business class has been overhauled in recent years with an airy new interior, lie-flat seats and direct aisle access for nearly every passenger. Even though Etihad owns a huge portion of Alitalia and is part of its partner network, it’s not easy to redeem miles for Etihad’s legendary upper class seats. It’s unfortunate that you can’t get first class award seats on any partner airline, but not being able to try Etihad’s First Apartments is particularly disheartening. Adding to the frustration, Alitalia charges 180,000 miles roundtrip to fly Etihad’s business class. Knowing that Alitalia’s own U.S.-Europe roundtrips in business class are only 80,000 miles makes that price seem very steep. But when you consider that American Airlines charges 180,000 miles roundtrip for first class awards on Etihad, it’s not the best idea to use Alitalia miles for these coveted awards. Alitalia gives you more leeway than many airlines in terms of cash ticket upgrades. In economy, a Y, B, M, H, K, V or T fare can be upgraded to premium economy from the U.S. to Italy for as low as 12,500 miles. You can upgrade with miles during check-in at the airport. A co-branded American Express credit card is available to North American flyers from First Bank. The Alitalia American Express card typically carries a sign-up bonus of 10,000 miles, though it can occasionally rise to 15,000 miles. The initial 10,000 mile bonus comes after the first purchase, while the additional 5,000 miles require a $20,000 spend in the first year after the account is opened. While many co-branded credit cards add on perks that apply to every flight you take with an airline, Alitalia issues its perks in one lump. Each year, cardholders get vouchers for two free checked bags, two lounge passes and a $50 coupon. If you’re purely looking to rack up miles, it would be better to transfer from one of Alitalia’s credit card transfer partners.